This is the absolute best Peanut Butter Fudge you will ever taste and it’s so easy to make in the microwave. It’s unique ingredients give it an incredibly smooth texture and a lovely peanut butter flavor. There are many different recipes for making quick peanut butter fudge, but none quite like this one made using creamy peanut butter, peanut butter chips, and white chocolate. It is the best homemade peanut butter fudge you will ever taste. Most easy peanut butter fudge recipes combine butter and peanut butter with a large amount of powdered sugar and a bit of vanilla. This makes a good fudge, one which I have enjoyed many times, but it can taste overly sweet, can be dry or even be greasy. 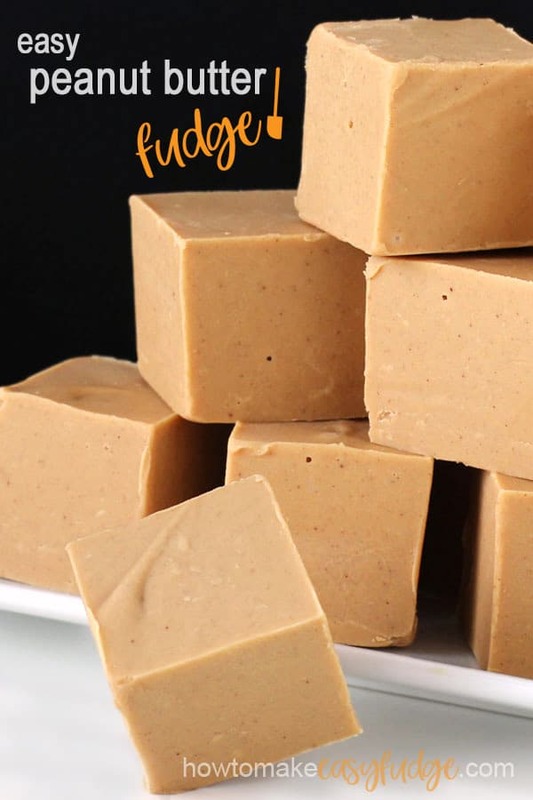 Traditional old-fashioned peanut butter fudge recipes have you boil sugar with milk, butter, and peanut butter and can be challenging to make and may end up having a grainy texture. Plus the traditional recipe is time consuming and requires a candy thermometer. This easy microwave peanut butter fudge recipe makes perfect fudge every time. It has a robust peanut butter flavor and is not overly sweet. The fudge looks and feels firm, but when you take a bite you will be amazed to find the fudge has an incredibly creamy texture. It practically melts in your mouth. You can make it plain using the recipe below or top it with chocolate to make Chocolate P.B. 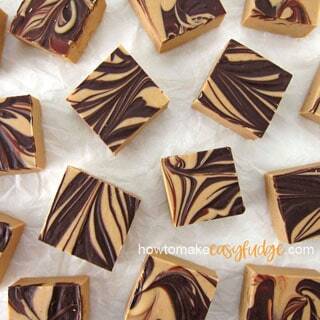 Fudge or even Tiger Butter Fudge. and you can even use it to make a Fudge Starfish, or Fudge Hearts, and even Fudge Cauldrons. This 4-ingredient peanut butter fudge recipe is so simple. You just melt the peanut butter chips and white chips together in the microwave then stir in the peanut butter and salt, pour it into a pan and let it sit overnight to firm up. Easy, right? See the recipe below for detailed instructions. Before you begin, I thought I’d answer some of the most commonly asked questions about making this microwave peanut butter fudge. 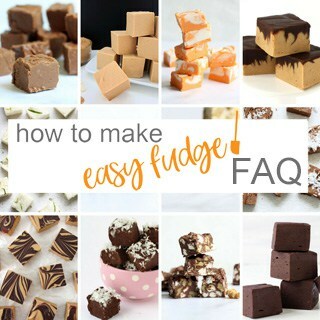 You can read all our tips for making easy fudge on our FAQ page. 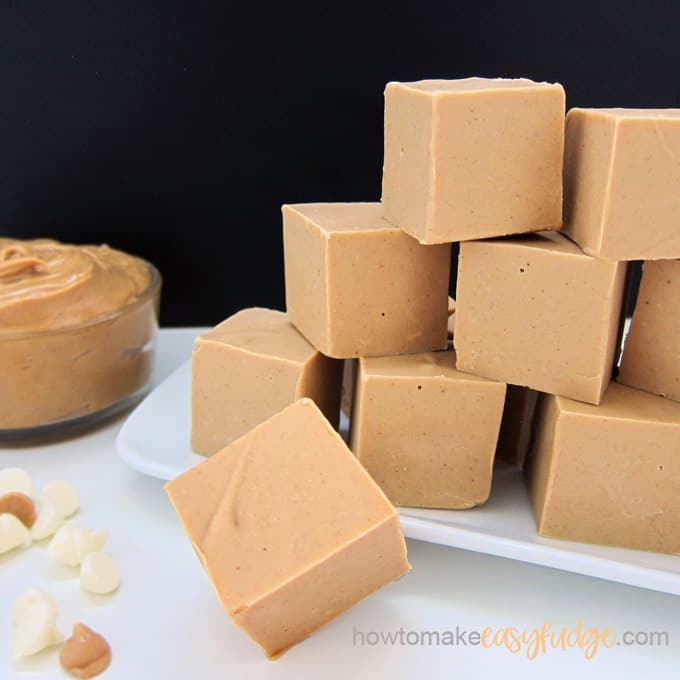 What size pan should I use to make this microwave peanut butter fudge? You’ll want to use a 9 by 13 inch pan. This recipe makes a large quantity of really thick pieces of homemade peanut butter fudge. You can cut the recipe in half if you just want to just fill an 8 inch square pan or you can fill two 8 inch square pans using the recipe as written if you’d like thinner fudge. You can use metal, glass, ceramic, tin foil, or silicone pans. Lining the pan will make removal of the fudge much easier than if you just buttered or sprayed the pan. You can line the pan with non-stick tin foil, regular tin foil that is buttered or sprayed with cooking spray, or with strips of parchment paper. If you use a silicone pan you do not need to line it with anything. The fudge should release beautifully from the silicone pan. What kind of white chocolate chips make the best peanut butter fudge? I use Nestle White Morsels or Peter’s IceCaps to make this peanut butter fudge. I have been making this type of fudge for almost 30 years and I have experimented with many different brands of white chocolate and find that everyone I serve this fudge to agrees that the flavor is best when I use either of those types of white chocolate. Nestle White Morsels and Peter’s IceCaps are actually confectionery coating (a candy similar in taste and texture to chocolate that does not contain cocoa butter). They have a nice creamy texture and sweet white chocolate flavor. 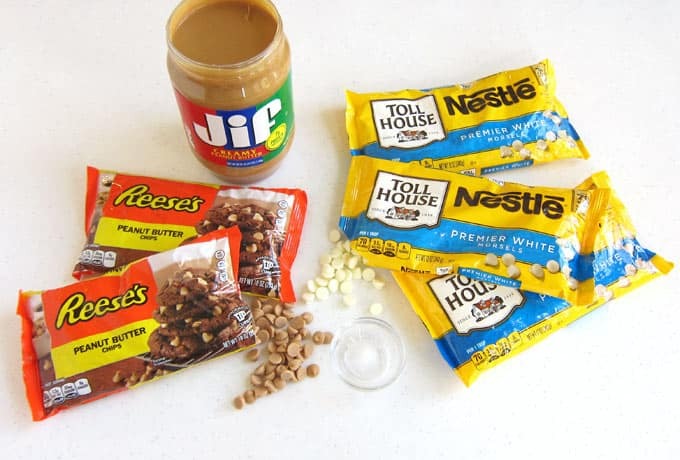 You can also use White Candy Melts, white almond bark, or Ghirardelli White Melting Wafers if they are easier for you to find, but the flavor will be a bit different. You can also use pure white chocolate but they tend to have a more robust custard-like flavor which may mute the peanut butter flavor slightly. You will also need to increase the amount of white chocolate to 42 ounces in order for your fudge to set up properly. What are Peanut Butter Chips and where can I find them? Peanut Butter Chips are also a confectionery coating that taste like peanut butter. I use Reese’s Peanut Butter Chips which can be found at most grocery stores in the United States including Target, Kroger, and Walmart. 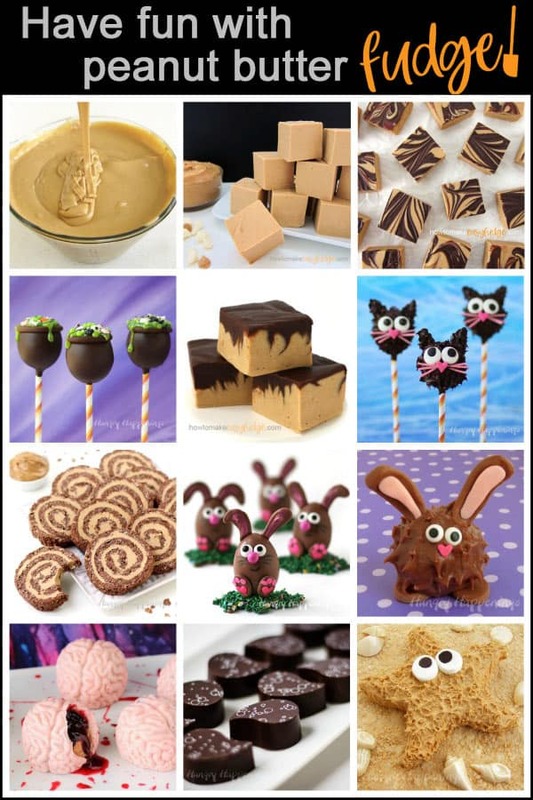 You can also use Mercken’s Peanut Butter Candy Coating or Peanut Butter Candy Melts. What peanut butter should I use to make my fudge? I use Jif Creamy Peanut Butter and love the flavor of the fudge it makes. Choose your favorite peanut butter if you prefer a different flavor. NOTE: I have not tested this recipe using a natural peanut butter but assume that if it’s well stirred that it will work alright. Combine white chocolate and peanut butter chips together in a large microwave safe mixing bowl. Heat for 60 seconds on high power, then stir. Heat for another 60 seconds on high power, then stir. Then heat for 45 seconds and let the bowl sit in the microwave for 3 minutes before stirring. If all your white chocolate and peanut butter chips are not melted at this point you can heat for 15 second increments, stirring after each, until melted. When you are melting chocolate chips of any kind in the microwave, they will appear to hold their shape until you begin to melt them. It is important that you no overheat the chocolate or it will burn. So be sure to heat and stir even though the candy looks solid. Microwaves heat from the middle out so you need to move the chocolate that is hotter out so it won’t continue to heat up. Now stir in creamy peanut butter and salt. Pour into a 9×13 inch pan and set aside for at least 6 hours. This recipe will create amazingly smooth and creamy fudge. Use creamy peanut butter to get the best texture. 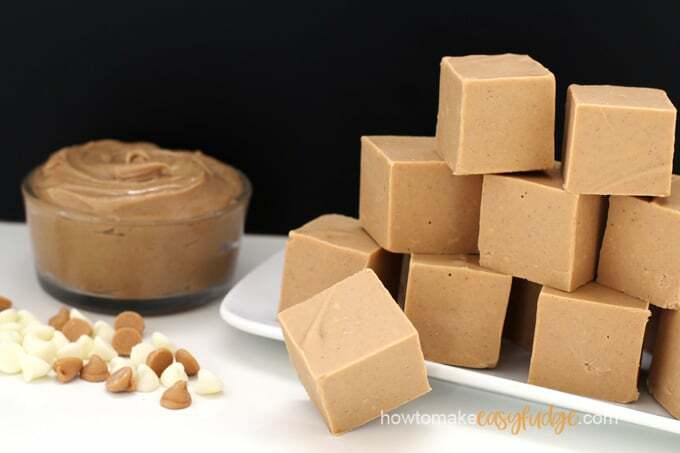 This 4-ingredient microwave peanut butter fudge it so easy to make and is creamier than any other fudge you've ever tasted. *NOTE: If using pure white chocolate instead of the Nestle White Morsels, use 42 ounces. Line a 9 inch by 13 inch baking pan with non-stick tin foil or parchment paper. Combine white and peanut butter chips in a large (12 cup or more) microwave safe mixing bowl. Heat another minute, then stir, and another minute, then stir. Then heat for 45 seconds and let the bowl sit in the microwave for about 3 minutes. Remove and stir until completely melted. Cover with tin foil and set aside for about 6 hours. To speed up this process you may refrigerate for about 2 hours. Cut into 96 squares and serve. *You can use white confectionery coating wafers (like Candy Melts) in place of the white morsels. For thinner fudge pour into two 8 inch or 9 inch square pans. For really thin fudge pout into two 9x13 inch pans. If you cut into 48 larger pieces (as you see pictured) each piece will have 326 calories. A metal tin will keep the fudge the freshest for almost 2 months. A plastic airtight container will keep this fudge fresh for about 1 1/2 months. You can freeze this peanut butter fudge. Wrap it well in wax paper, place it in a zip top bag and inside an airtight container to keep it from picking up any odors in the freezer. It will keep in the freezer for up to 6 months. To thaw, remove from freezer and let sit at room temperature in it’s container for at least 1 hour before opening. I hope you enjoy this recipe for homemade peanut butter fudge. I think it’s the easiest microwave peanut butter fudge recipe that makes the most amazingly creamy fudge. If you agree that this is the best peanut butter fudge in the world, I’d love to hear it in the comments below. Can you believe that each of the treats pictured above is made using this creamy peanut butter fudge? See the other step-by-step recipe tutorials at HungryHappenings.com. 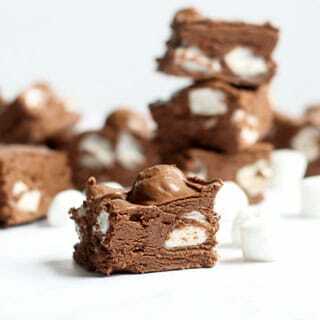 If you want to see more easy fudge recipes be sure to check these out. Thank you so much for dropping off some of this fudge at the fire station. It’s awesome! You can drop by with more fudge anytime you want. We will be happy taste testers. Thanks, Steve. I’m so glad you all enjoyed the fudge. I’ll be making a lot more fudge and will be sure to bring more over to you guys. This truly is the BEST peanut butter fudge. I will make this again and again. I’m glad you enjoyed this easy fudge. I totally agree that it’s the best peanut butter fudge ever! This looks so creamy, can’t wait to give it a try! It is seriously, melt-in-your-mouth creamy! I hope you love it. Thanks for sharing your easy peanut butter fudge recipe. I’ve made the fudge that way too and it is lovely as well. I do hope you give this peanut butter fudge recipe a try. I’d love to hear what you think! Can’t wait to try this – looks so easy and delicious! 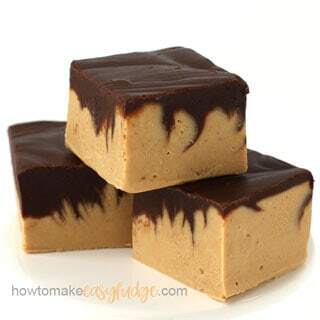 Love anything with peanut butter and this fudge looks incredible! It is incredible! I hope you give this easy fudge recipe a try. I know for sure this peanut butter fudge would be a huge hit in my house! I’m so happy to hear that! Enjoy. Does it get better than fudge + then who doesn’t love PB – this looks freaking amazing! My whole family loved this fudge. It is quite unique in texture and flavor. It has such a great peanut butter flavor and is not overly sweet or dry, like you said. I’m not a fan of peanut butter fudge made using powdered sugar because I find it too sweet and dry but that’s what everyone seems to make. I brought this fudge to a party and people couldn’t stop eating it. I’ll definitely be making this for year’s to come. You are right!!! This is the creamiest peanut butter fudge I’ve ever tasted. It’s definitely different than any fudge I’ve ever eaten. I cut squares then dipped them in chocolate and it was so amazing. I plan to make hearts for Valentine’s Day. Thanks you, thank you, thank you for this yummy recipe. Deborah, I am so glad you loved this fudge! If you want to make peanut butter fudge hearts for Valentine’s Day, you can pour the fudge into silicone molds, then freeze the fudge, and simply pop it out of the mold. Then let the fudge warm up to room temperature before dipping. Or you can “paint” chocolate into a heart shaped mold, allow it to harden, then pour the fudge (allow it to cool so that it isn’t too warm) into the chocolate heart, filling it up so that you have enough room at the top to cover it with another layer of chocolate. Then refrigerate the mold until the peanut butter fudge is firm, but be sure to allow the mold to come to room temperature before topping the fudge with a thin layer of chocolate. Enjoy! This is AMAZING! I’ve never tasted peanut butter fudge quite like this. You are right, it is so incredible creamy. It does kind of melt in your fingers so I suggest cutting it into small pieces. I actually cut the recipe in half and poured it into a 9X13 inch pan so my pieces were thinner. It was perfect. Thanks so much for this wonderful peanut butter fudge recipe. I will be making it for years to come. Hi Gemma, I couldn’t be happier to hear how much you loved this peanut butter fudge recipe. Making half this fudge in a 9X13 inch pan is a good idea if you don’t want really thick pieces. When you cut into the full batch you do get cubes because the fudge is quite thick. I am questioning the “40 ounces of Jif Peanut Butter in this recipe. The video shows you adding 2 scoops of peanut butter. A normal size jar is 15 -16 ounces. 40 ounces seems excessive. How much to use? I really want to make this. You do use an entire 40 ounce jar of Jif Creamy Peanut Butter. It is the largest jar you can buy at the grocery store. This makes a HUGE batch of fudge as it fills a 9 inch by 13 inch pan almost to the top. You can easily cut this recipe in half or even in 1/4th if you need less fudge. Is it really 40 ounces of Peanut Butter?!? This is the second time I ask. Sorry you didn’t see my earlier reply. OMG, this was the best peanut butter fudge I’ve ever tasted. It is so different in texture and in flavor than anything I’ve ever tried before. I cut squares then dipped them in chocolate and WOW it was good. Thanks for thinking outside the box and for sharing such a unique and delicious peanut butter fudge recipe. Wow! We are so happy to hear such a rave review for our unique peanut butter fudge recipe. Thanks for leaving a comment to let us know how much you liked this recipe. Best peanut butter fudge ever!!!!!!!!!!!!!!!!! !